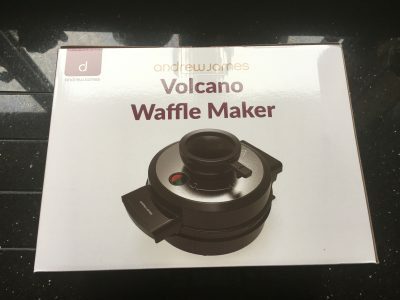 The volcano waffle maker was awarded the prestigous 2017 IHA Global Innovation Award for its unique design. The sloped shape of the waffle maker means it cooks the waffle mix from the bottom up. 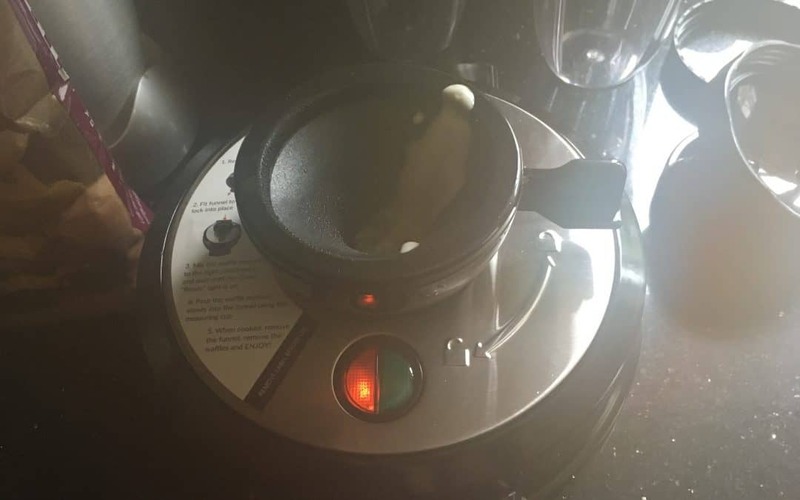 Additionally, the gently cone-shaped waffle plates result in the batter accessing every corner of the waffle maker, which produces an evenly round and deep cooked waffle that cooks in under 5 minutes. My children are not small (both bigger than me sadly) but they are very fond of waffles and like the sound of potentially getting messy in the kitchen, so we gave it a go. The waffle maker came in a nice simple package. I’ve not had a waffle iron before and somehow it was smaller and lighter than I expected it to be. It has a removable funnel that sits on the top of the device, and I love the fact that when you are not using the funnel it stores away and locks underneath the device. That’s a very clever design. 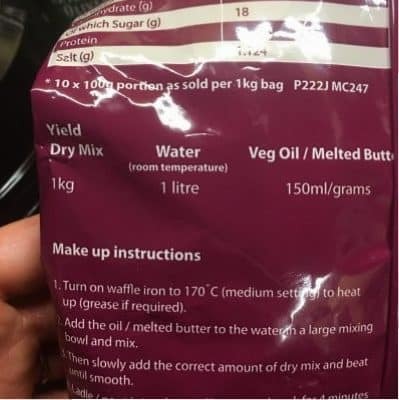 I understand that for 1 kg of mixture you should add 1 litre of water (so 100ml per portion), but then you should add 150/ml of oil or butter for ??? grams? I made the assumption that it was 150ml oil, along with the 100ml of water for 100g of mixture, but I’m not sure if that was right. I used vegetable oil for the first attempt at making waffles. It made a lovely looking waffle but it tasted a bit oily and gereasy. I will experiment with butter next time I use this packet. This is where it gets fun. 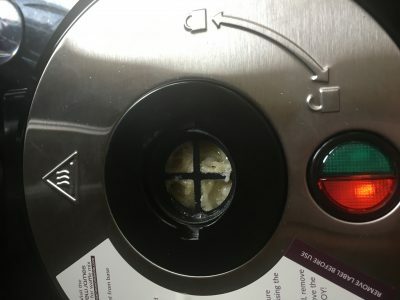 You have to put the spout on the top of the waffle iron and pour the mixture in very carefully so you don’t block the spout, and also making sure it goes in each of the four holes equally. 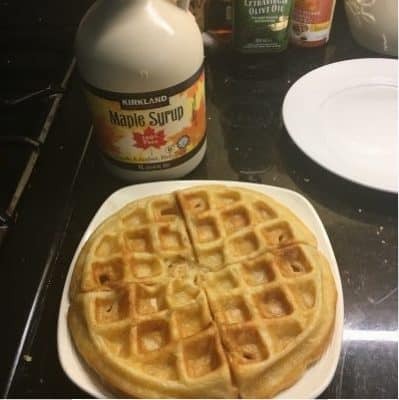 When I made my second one I blocked the holes up too quickly so no more mixture could get in and so my waffle was thin and lacey with holes. Lesson learned for next time! When you get it right the mixture will bubble up back into the spout, a little bit like a volcano, hence the name of the waffle iron. Et voila! A rather nice waffle, which could be split into four for smaller children, but my teenagers like them just like that! Sift together the flour, baking powder and cinnamon in a large bowl then stir in the sugar. Separate the eggs, beat the yolks in a small bowl then add the milk, melted butter and vanilla extract. Gradually pour in to the dry mix and whisk together until smooth. In a food mixer, beat the egg whites until they form stiff peaks then carefully fold in to the batter mix. 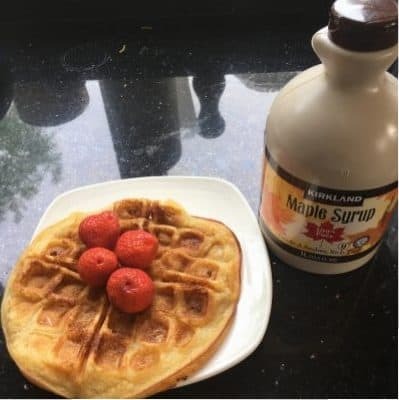 Ladle a spoonful or two into the centre of a pre-heated, lightly grilled waffle maker griddle and leave to cook for 1-2 minutes or until golden brown. I’m a very unfussy cook, so I’m afraid I melted the butter and didn’t allow it to cool. I put the eggs in whole instead of doing the stiff peaks bit. And then when the batter was ready, I thought it looked a bit thick to pour into the little holes, so I added a little bit of extra milk. Sadly the result of this was a waffle that tasted delicious but it flopped and didn’t stay puffy. I’m not sure which of those omissions caused the waffle to fail, but I will keep trying…. This was still pronounced delicious by my teenagers and their visiting friends, so all is good even if the look leaves something to be desired. 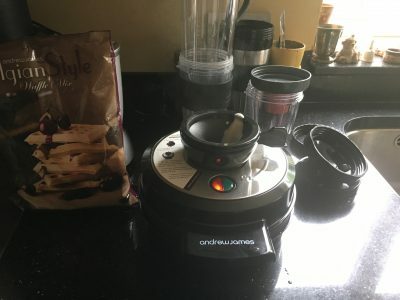 So, all in all it looks like the volcano waffle maker is a big hit, and I would recommend it if you have kids who love waffles. I will keep experimenting – I’m sure the perfect waffle recipe is out there somewhere…. and when I find it, I will tack it on to the bottom of this post!